You know when you’ve had one of those weeks where everything just becomes a little too much? Yeah, I just had one of them. Our list of things to do was impossibly long and never seemed to get any smaller as the week went on! Come Thursday, We were feeling restless and wanted some chill time with each other. Having had such a hectic week, we were fortunate enough to find some time together though we took some time to decide on where we should go. It was then that we decided to go to Tukdin, a popular Malaysian restaurant just a few minutes away from all the tourist traps in Paddington. No harm in some comforting Malaysian staples before we get busy! Starting off with an order of drinks. Sirap bandung Muar (Pink drink with rose syrup, milk and cream soda) and Susu kacang cincau; A simple drink made with soya bean and delicious cubes of grass jelly that toned down the sweetness. For starters we ordered the Karipap which is a potato-filled pastry or chicken, rather like a samosa. The filling also had peas and spices, overall it was moist and filled with flavour. With an order of the chicken satay (Satay goreng). A long plate arrived with a heap of delightful chicken chunks, a bowl of peanut sauce (The Satay Sauce), and cubes of white rice – a different but much easier way to enjoy the traditional chicken satay. The chicken had been thoroughly marinated so that the lemongrass flavouring stood out, and were then fried well that they were not greasy. But how could I forget that smooth yet slightly chunky satay sauce with little chilli spikes! Absolutely perfect for dunking the chicken into and we managed to polish this dish off in record time! Fillets of seabass that had been deep fried so that the skin was delicate and crispy. The fish was then topped with a layer of chopped chilli and a special sweet and sour sauce (Tukdin’s special sauce) that was not uncomfortably spicy but provided a discreet kick in the taste buds. The final bill amounted to approximately £40 for two people, including drinks and food, which is great for value considering the delicious food and location! The amount of food we had ordered was just about the right amount for two people; maybe a little more but we managed to eat the majority of the meal. The service was helpful and attentive plus the restaurant had a lovely, cosy atmosphere which is perfect for a casual date night. 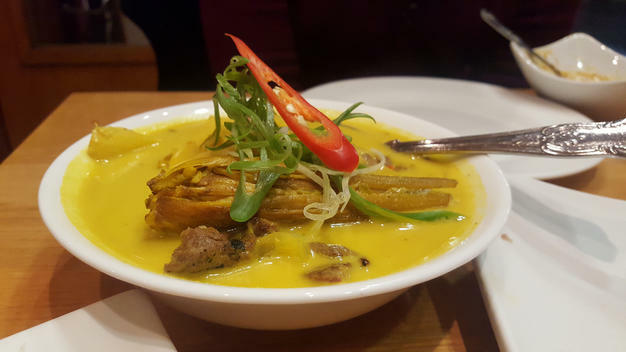 Tukdin- Flavours of Malaysia was a pleasant surprise and we really enjoyed our meal there. Considering more than half of our dishes were fried. We didn’t feel heavy but in fact, left the restaurant as if we just had been given a big, warm, comforting hug. Tukdin had provided the perfect food for us to cheer up and be energised for the crazy, busy week ahead of us! P.S. a few other recommended dishes to order if you do visit, which are the garlic fried chicken, the Beef rending, pasembor (mixed vegetable with prawn fritters), sambal udang tomato (prawn cooked with sambal and egg sauce, and the aubergine with chilli sauce.